Welcome to our school's website. If your child is joining us for the first time, we welcome you as parents and look forward to a happy and successful partnership over the coming years. If you already have a child here, we hope to strengthen our existing links with you to enable us to provide the best education possible. Our motto is ‘The Best in Everyone’ and so we are committed to providing the highest standard of education for every pupil. We share, with parents, the responsibility for teaching our children and preparing them for the future. Our children really matter and every individual’s ability is recognised, developed and rewarded. If you are thinking of bringing your child to The Victory Primary School please make an appointment by calling us on 023 9200 1160. I will be pleased to personally show you around the school. If you have any concerns please make contact with us as we are always ready to discuss any matter with you. Article in the local paper about our OFSTED Report. 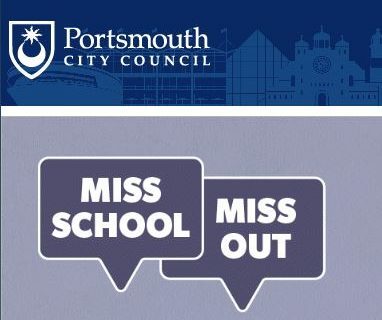 Portsmouth city will see the launch of a two year school attendance campaign this week – Miss school, miss out! The new ‘Miss School, Miss Out’ campaign aims to improve school attendance levels in the city by highlighting to parents / carers and students what they can achieve if they have good attendance and reach their full potential, as well as illustrating how missing school can limit their future lives.